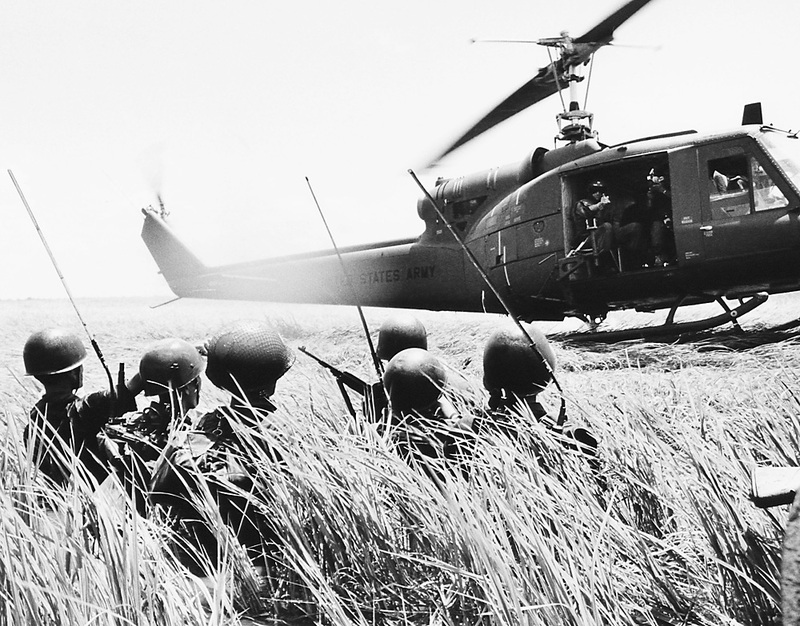 A Vietnamese troop reconnaissance unit walks hip-deep in water towards helicopter in the Mekong Delta on Oct. 13, 1964. Vietnam’s professional military is closely integrated with Russian defense hardware and systems, making it difficult for a third country to crack the market. Days after lifting the decades old arms embargo on Vietnam, the United States is expecting a flood of orders from Hanoi. An arms industry source told Defense News that Vietnam is seeking to improve its security capabilities by the procurement of F-16 fighter aircraft, refurbished P-3C Orion maritime patrol aircraft armed with torpedoes and advanced military drones. But there’s a yawning chasm between speculation and reality. Vietnam’s professional military is closely integrated with Russian defense hardware and systems, making it difficult for a third country to crack the market. The peculiar American double standards on human rights issues could also derail any potential arms deal. While the oil-soaked theocracies of the Middle East such as Saudi Arabia get a hall pass, Vietnam’s authoritarian government will most likely be held accountable to a different yardstick. Democratic Republic of Vietnam, May 1969. Source: Valentin Sobolev. *Long-range submarines, likely to be armed with 533mm heavy torpedoes and Klub-S missiles. *6 stealthy Gepard Class light frigates, each armed with 8 Kh-35E anti-ship missiles, or 4 SS-N-22 Sunburn supersonic anti-ship missiles. *Agreement to license-build the Russian Kh-35 anti-ship missile. *Four more Su-30MK2 fighters, which will increase the air force fleet to 36 by the end of 2016. The latest order worth $600 million, for 12 jets, was signed in 2013. Russia may not be Vietnam’s exclusive arms provider, but it is clearly its most important defense partner. Besides the high-octane hardware mentioned above, Hanoi is tied into the Russian defense ecosystem in other critical ways. For instance, flight training for the Vietnamese air force Su-30s is being provided by the Indian Air Force, which operates the same Russian aircraft. India has also trained Vietnamese naval personnel in operating Russian Kilo-class submarines. Defense Industry Daily (DID) reports Vietnam is investigating the possibility of upgrading at least some of its existing fleet of about 480 T-72 main battle tanks, and buying T-90s to begin replacing their force of almost 1,000 elderly T-55s. Due diligence has reportedly been done with India’s T-90s, which also face the ravages of hot climates. Although Russia has been a reliable arms supplier, over time Vietnam would want to diversify its purchases. In theory, America’s well-stocked weapons supermarket allows the Vietnamese military to cherry pick items but the reality is the US simply cannot match Russia's terms, often backed by liberal loans. Still the Americans are hopeful that even smaller deals could lead to wider cooperation such as military exercises. According to the Navy Times, with weapons sales to Vietnam there will be the possibility of American troops deploying to the country as trainers to get the Vietnamese up to speed on their new gear. “The State Department is already working on an initiative that could bring ground troops to Vietnam. The Vietnam Peacekeeping Center is a joint effort with the Vietnam and the US. It's a training center designed to help boost Vietnam's ability to contribute to UN peacekeeping missions. According to an unclassified defense industry briefing prepared by the US Pacific Command, Vietnam’s goals are to enhance its presence in the South China Sea with upgrades for submarine warfare, maritime air-ground interdiction, anti-surface warfare, anti-submarine warfare, maritime domain awareness, early warning, and command, control, communications, computers, intelligence, surveillance and reconnaissance. As per the report, titled ‘Socialist Republic of Vietnam – Country Security Cooperation Plan,’ the United States aims to be a “reliable partner to address complex, forward looking security issues.” It also hopes to establish military relationships outside the traditional theatre support command that include defense sales, cross-servicing, voyage repairs, and science and technology cooperation. China is the glue that could add some substance to Vietnam-US ties. During the Vietnam War, Beijing played a critical role as a conduit for Russian weapons meant for the Vietnamese military. But that communist bonhomie is long gone, mainly due to China's “aggressive pursuit of claims to 90 per cent of the South China Sea”. The two countries have fought each other in the past over their overlapping claims. Unlike in the past when Moscow could be relied upon to back Hanoi in a shooting war with the Chinese, today Russia is playing a more balanced role in the region. Russia is unlikely to back one or the other. With the US, it’s different. Twenty years after re-establishing diplomatic ties, Washington sees Hanoi as the enemy’s enemy, and therefore a friend. The US is backing South East Asian nations in their territorial spats with China, and hopes Vietnam will play along. However, it won’t be entirely smooth sailing. Barak Obama may have gone to Ho Chi Minh City and exchanged pleasantries, but neither side has forgotten the horrors of the Vietnam War, which killed one million Vietnamese and 58,000 Americans. In this backdrop, recent attempts to normalize relations have only stirred up painful memories. For instance, there has been a backlash against the decision to hand the chairmanship of Fulbright University Vietnam to a former US senator accused of involvement in a massacre during the Vietnam War. Bob Kerrey, a former Democratic senator and governor of Nebraska, was one of leaders of the 1969 raid on a communist-controlled village in which his Navy Seal platoon killed at least 13 unarmed women and children. The attack was made public in 2001 following a media investigation. Kerrey has expressed remorse but many Vietnamese are seething at the appointment of a man with innocent blood on his hands as the head of a university in their country. Similarly, My Lai, Agent Orange, Operation Linebacker and other war crimes will continue to bedevil mutual relations for years, if not decades. Meanwhile, Russia – which remains a savior nation in the eyes of most Vietnamese people – will continue to remain the more trusted strategic partner. And Hanoi’s prime arms supplier. Read more: Is the U.S. behind Japan's reluctance to sign a peace treaty with Russia?